We’d like to give honorable mentions to the titles that came close to placing on the final ballot. 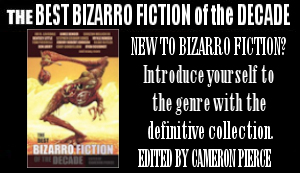 These titles are: Deadly Lazer Explodathon by Vince Kramer, Spermjackers From Hell by Christine Morgan, The Long Night of the Eternal Korean War by G. Arthur Brown, Embry Hard-boiled by Michael Allen Rose, and Slices by Scott Cole. Voting ends December 31st. Only BizarroCon attendees are eligible to vote. 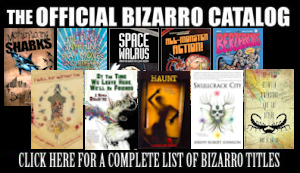 Send your votes (one per category) to bizarrocon@gmail.com. 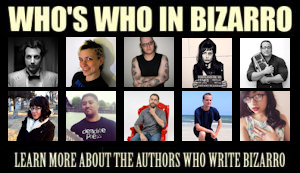 The Wonderland Book Awards for excellence in Bizarro Fiction are presented annually at BizarroCon in Portland, OR.